The first zero-emissions hotel in downtown Milan, the Hotel Milano Scala is a sophisticated, boutique hotel just a short walk from the famous 'La Scala' Theatre. Milan’s celebrated fashion district and delightful Brera neighbourhood are also close by. 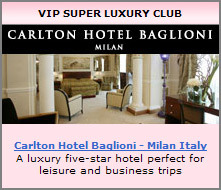 With 62 rooms, including 10 suites, Hotel Milano Scala offers guests a unique hotel experience. Each one of the elegant rooms is themed around music and culture, with the furniture and artwork carefully selected to reflect these themes. The hotel’s Restaurant, La Traviata, provides guests with a refined environment to relax and dine with friends. The Sky Terrace Bar, with its panoramic 360-degree view of Milan, invites guests to sip on a delicious cocktail as they enjoy the stunning vistas. The hotel also has a well-equipped fitness centre and secure car parking facilities. All care has been taken in the design of the hotel to ensure a minimal impact on the environment. Guests can rest easy, knowing their stay will produce zero emissions. Welcome to Holiday Inn Milan Linate! The hotel Holiday Inn Milan Linate - in a green area near the Idroscalo - is located in a strategic position between Milan Linate Airport (2 km) and Linate corporate district (IBM, 3M, HP, DHL and Microsoft). The hotel is just 5 km far from Segrate Railway Station, connecting to FieraMilano in Rho. Not far from the Duomo and Milan shopping area (15 km), Holiday Inn Milan Linate hotel offers 142 rooms equipped with individual controlled air-conditioning, Sat & Pay TV, Wi-Fi connection powered by a leader provider and minibar. Guest can enjoy tasting regional and national dishes at the L Ancora restaurant and fresh cocktails and drinks at the corner bar. Moreover, 5 meeting rooms up to 65 delegates and free parking place. For the guests, free shuttle service to/from Milan Linate airport (every 30 min. from 6.00 to 11.00 and form 19.00 to 24.00; on request on other hours) and to/from nearby corporations. Located within the heart of the Viale Certosa business district the stylish six-floor Doubletree by Hilton Milan hotel offers contemporary accommodations and superlative business amenities. Be welcomed at Reception with a warm freshly baked chocolate chip cookie before checking-in to your comfortable guestroom featuring luxurious Sweet Dreams beds. Only 10 minutes from the city center and built predominantly using glass and wood the hotel is both spacious and elegant. Energise with a cardio workout in the modern Precor Fitness Center and relax after an afternoon of meetings with a cocktail in the sophisticated Glass Bar. Holiday Inn Milan Hotel creates the ideal atmosphere for a relaxing stay no matter whether you are travelling on business or for leisure. The Hotel enjoys a prime location in the heart of primary business district of Milan near Vodafone complex. The Hotel provides excellent access to the City Centre and the Exhibition Grounds Holiday Inn Milan is ideally located in the business district, 2,5 Km from the Western Ring Road (Lorenteggio exit), and just 3 Km from San Siro football stadium. Il Molinetto Restaurant offers a wide choice of Italian & International Cuisine. Our Bar Le Guglie offers the finest aperitifs in town in a classy and relaxed atmosphere. Holiday Inn Milan boasts the latest in technology providing WI-FI connection in hotel public areas and High Speed Internet access in all hotel rooms. For our Business customer Holiday Inn Milan guarantees successful meetings with four Conference rooms, with capacity up to 85 people, that feature WI-FI Connectivity and Full Audiovisual equipment. A charming 3 stars Hotel , located in a very quiet area in the north of Milan just 1 minute walk from a nice park, ideal for jogging and equipped for children. Our qualified multilingual staff are always pleased to cater for your needs. Comfortable rooms with parquet flooring, private bathroom, TV, Phone, access to internet, air conditioning and laundry sevice . Rooms with facilities for disabled people are also available. At ?La Residenza? you will find the ?Sunflower Restaurant? a very nice dining room where we serve a typical Italian menu and where we also organize parties to celebrate birthdays, marriages, degree ceremonies etc. . A very rich buffet breakfast is served from 7.00 a.m. to 10.00 a.m. Don?t miss the experience of tasting one of our genuine wines selection at the ?Wine Room? where you?ll find on sale presentation box with 2 tasting glasses and a bottle of wine at your choice as an ideal Italian souvenir. Welcome to Holiday Inn Milan Assago! At the entrance of the city, the hotel Holiday Inn Milan Assago is strategically located near the A7 motorway and to Assago Datch Forum and Milano Fiori Congress Centre. Milan, its monuments and restaurants are really close: just take our free shuttle to/from the subway (Green Line Famagosta stop - not reachable by feet) and enjoy Piazza del Duomo, the Sforzesco Castle or have a tour of Milan fashion district! At just 19 km, Milan Trade Fair is also easy reachable. Free shuttle service to/from the exhibition area (Rho) during the main expositions. With 203 rooms provided with individually controlled air conditioning and Wi-Fi Internet connection, a fitness centre, 17 meeting rooms and an outdoor swimming pool (open from June to September), the Holiday Inn Milan Assago hotel is ideal for business meetings, banquets or a relaxing stop-off during a driving tour (extensive parking facilities). The Alla Bell Italia restaurant serves tasting Italian and regional dishes, while the Pavillon Cafe excellent snacks and drinks. The Hotel Bogart is a small and welcoming family owned hotel where courtesy, professional attitude, comfort and services are guaranteed to make your stay a great one, be it for work or leisure. In a villa dating from the beginning of the 20th century we find here large, bright and completely restored rooms with a functional and sober decor, which fits in with the original structure of the villa, making the Hotel Bogart one of the best 2-star hotels in Milan. The Giulio Cesare hotel was completely renewed, it has rooms with private bathroom, air-conditioned and Bar. It is located in the heart of old Milan between the Dome, the Scala Theatre and the Sforzesco Castle. The hotel was entirely renewed outside as well as inside. The rooms are elegant furnished and all rooms are provided with private bathroom, air conditioning, SatTV, telephone, Safe, hairdryer and American Bar. Pets are allowed.